Rune Werner Molnes was born in 1978 in the town of Bergen, Norway. This is also where he has had his photographic base the last couple of years. However, his inspirational muse was found through the encounter with the rugged coastal landscapes of his home Island of Vigra, outside the town of Aalesund. His family have lived in this area for many generations. Growing up here has given him a strong bond to these melancholy, windswept coastal landscapes. 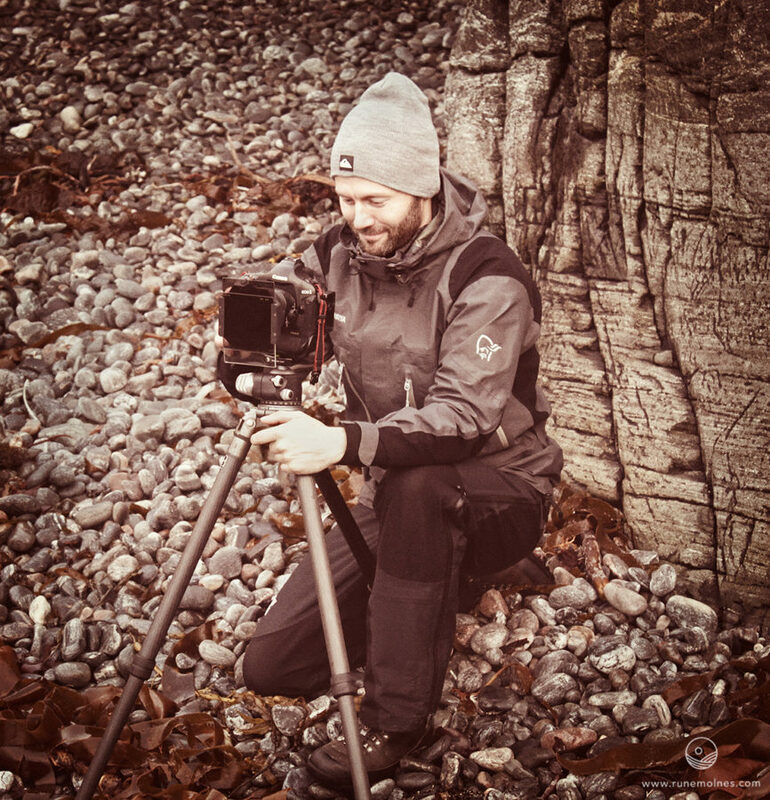 This was where his photography started, and he has since then ventured out to explore most of Norway's far- stretched western coastline, as well as the alpine areas along the sea front. His photographic quest has brought him to exotic destinations such as the Faroe Islands, Iceland and other parts of the far North. He intends to continue this journey through the Nordics, with future projects including destinations such as Greenland and Svalbard. Rune has a strong concern for the parts of nature which are still untouched by man. "Untouched nature is becoming a scarce recourse, and it is important for me to communicate the unique features of these places to as many as possible. Hopefully I will be able to make a small difference through my work." Apart from photography he has a passionate interest for music, existentialism and philosophy in general, interest which feed back into his photography: “Each landscape has its own melody and I always listen to music when post- processing my images. I usually find some music which suit the mood of the photograph in order to stir my own imagination, most of the time improving the end result." Atle Maurseth, curator and owner of Galleri Allmenningen, describes his photographs as "powerful - conveying the dramatic calm that can only be found in nature. Take his dynamic and energetic seascapes for instance, they have something distinctly Molnes' about them." “I suspect that trying to dissect the foundation for ones artistic motivation can be a perilous task for any aspiring artist. Those inspirational roots should probably be left alone in the realm of the subconscious. However some aspects spring to mind in an attempt to describe my relationship to photography, and why I have chosen to pursue it as an art form: That is a longing to understand and fully experience the grandness, mystery and innocence of nature that humans are so much a part of, but at the same time intrinsically separated from. An attempt at maintaining a child like curiosity and openness towards the world, despite age and reason working the opposite way. The magic of life and the frailty of the human condition. Existentialism. Conservationism. Recurring misanthropy in relation to the aggregate behaviour of our species. A perpetual quest for adventure and the constant awareness of my own mortality. These are the subjects and feelings I explore through my photography." Rune Werner Molnes is a member of the association of Norwegian visual artists (NBK) including it's sub organization BKFH. He is also chairman of the board and member of ISOTOP studio collective. So far some of his photographic merits include Vestlandsutstillingen and a Gold Award from Prix De La Photographie Paris. In addition he was among the finalist for the European Fine Art Photograph of the Year Award. Rune Werner Molnes' works have been published in international art magazines and aquired by well renowned businesses, collectors and public organizations. His photographs can also be seen in well- established galleries in Norway and abroad. Leaf AFi 7 digital medium format camera with Schneider lenses. Hasselblad 503CW analogue camera. Canon and Sony digital full format cameras. Wacom Intous4 pen tablet. Epson 11800 Pro printer. Profoto portable lighting rig.